The black box with big white letters stands inconspicuously on the Altonaer Balkon (Altoner balcony) in the beautiful harbour scenery. If the sun is shining – don’t be scared, just go in and close the door behind you. You have to wait few minutes till your eyes acclimatise to the dark. You’ll see the harbour upside down moving projected picture on a white wall. 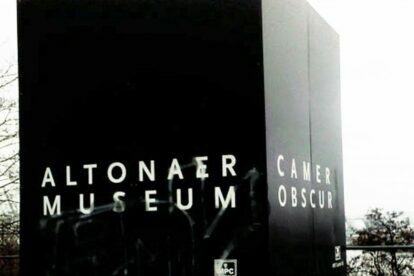 The Camera Obscura is deemed to be the forerunner of photo cameras. Invented in times of Renaissance also know as pinhole camera. It is a camera without a lens and a single very small aperture. The smaller the hole, the sharper the projection, an upside down and right-left reversed picture. It’s a pretty nice experience! And for free! BTW: The current projected picture can also be seen in the foyer of the Altonaer Museum. You could also try to take a picture (without flash) of the projection and yourself.